Are US History Textbooks Obsolete? It used to be that American students learned the history of their country from "official" sources — teachers and textbooks accredited and vetted by experts. But that’s no longer true. “Many of our pedagogies were developed at a time when there was a scarcity of information and so we needed to memorize things. We couldn’t lug a textbook around everywhere that we went,” says Sam Wineburg, professor of education and history at Stanford University and author of Why Learn History (When It's Already on Your Phone?). FILE — Teacher Xavier Chavez, standing, teaches a summer history class at Benson High School in Portland, Oregon. Beyond teaching students how to evaluate and verify what they find online, Wineburg believes history classes should also give students a broad chronological knowledge of history and a fundamental understanding of the nation's founding principles. 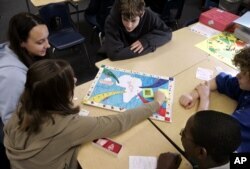 FILE — Eighth-grade social studies students at Mount Hebron School in Montclair, New Jersey, play a game they devised based on the story of the revolt on the slave ship Amistad. Students walk past a "Vote" sign next to an early voting site on the Florida International University campus, Oct. 23, 2018, in Miami.